Instagram is always improving its tools to make sure that the community is kept safe from content that violates its guidelines. However, things are very seldom black and white on the internet so like many services, Instagram is faced with the problem of content that’s technically not against their guidelines. And so Instagram has found a way to work around this problem by blurring some of the sensitive content that shows up. 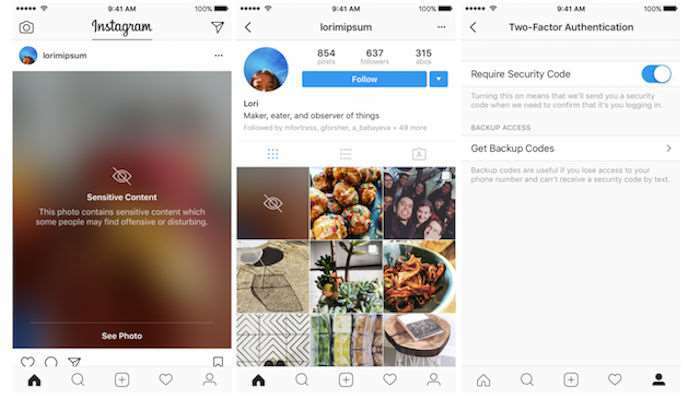 Instagram posts that don’t necessarily violate the guidelines, but are deemed to be sensitive will now be automatically hidden behind a blurred “Sensitive Content” warning. So posts that are reported as offensive by the community but don’t require a takedown action will be blurred. Users who would like to see these posts will have to tap on the Sensitive Content warning for the post to show. This blurred filter will be shown in both list and grid display modes. This will prevent users from having to go through surprising or unwanted experiences due to some content. The company has also confirmed that the two-factor authentication security layer it announced last year is now available for all of its users across the world. The company is making some big moves.